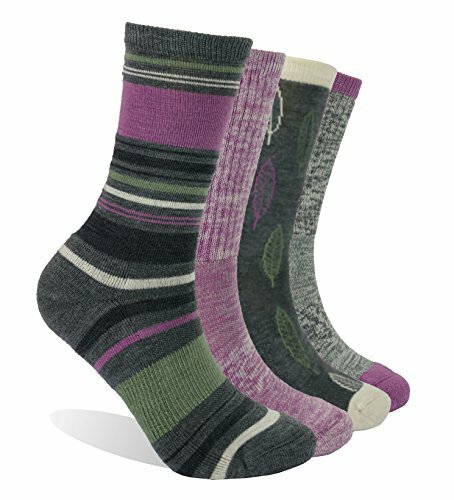 Enerwear Ladies Wool Trail Socks are in full cushion and reinforced at heel and toe for maximum comfort and durability. The socks offer moisture management fiber at the sole and maintains a cushioned feeling throughout. Soft wool provides natural comfort for all seasons and naturally repels bacteria. The breathable mesh supports your insteps, bringing maximum comfort and support all the time. Socks are machine wash cold inside out. Do not bleach. Tumble dry low. Do not iron. Do not dry clean. Made of high quality wool material, to keep your feet at optimal level warmth. Antibacterial deodorization effectively repels bacteria for up to 72 hours, making sure your socks stay clean and fresh for as long as possible. Designed for extreme weather conditions, great cold weather gear for outdoor activities and sports like skiing. Terry-loop cushioning throughout the entire foot, making the socks suitable for hiking, mountaineering, outdoor camping, cycling and longtime outdoor work. Package contains 4 pairs of multicolored socks. If you have any questions about this product by Enerwear, contact us by completing and submitting the form below. If you are looking for a specif part number, please include it with your message.